It fascinates me that every time there is an Open Skies Treaty-sanctioned overflight of the US by a Russian spy observation plane (in accordance with the treaty it has US personnel on board too) there isn't a peep in the US Media. I can only assume this is because Americans would freak out and riot of they knew they were being photographed from above by a Russian observation flight. MOSCOW, September 21. /ITAR-TASS/. 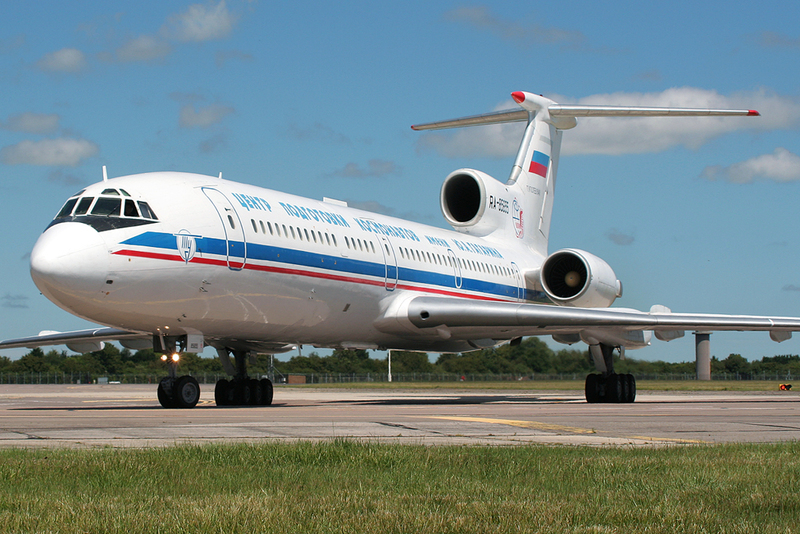 A group of inspectors will begin a monitoring flight by observation aircraft Tu-154M Lk-1 over the United States under the International Open Skies Treaty, the acting head of the Russian National Centre for Reduction of Nuclear Danger told Itar-Tass. “An observation flight at a maximum distance of up to 4,900 kilometres will be made from September 21 to 29 from the Open Skies airfield Wright-Patterson, Ohio,” Ruslan Shishin said. The Russian observation aircraft would make a flight on a route coordinated with a party under observation and American specialists aboard the airplane would control how monitoring equipment was used and the treaty’s clauses were fulfilled, he said. The observation flight is made to make military activity of the signatory nations to the treaty more open and transparent and to step up security through higher confidence-building measures. This is the 30th flight Russia makes over the territory of the treaty’s signatories in 2014. The Treaty on Open Skies was signed in 1992. As many as 34 countries joined the agreement. 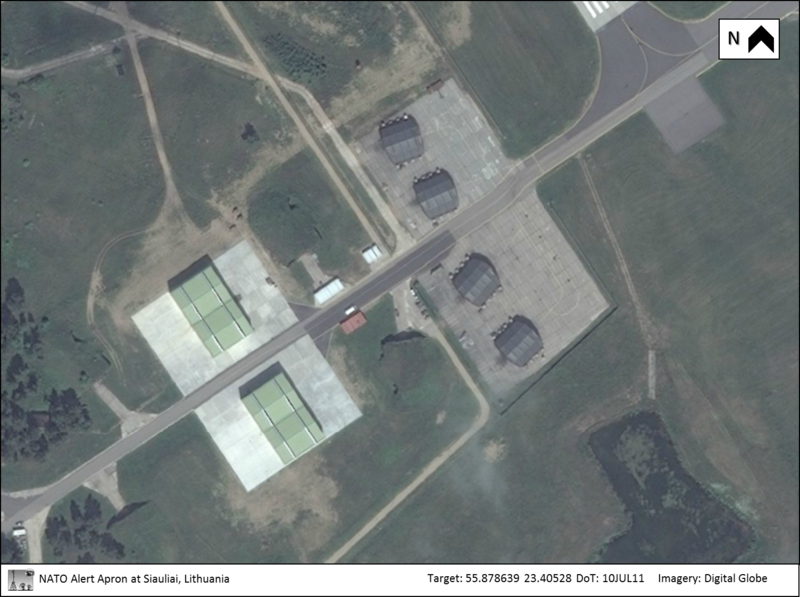 Observation flights are made over Russia, the U.S., Canada and European states. Open Skies top tasks are development of transparency, assistance to supervision over fulfilment of the arms control agreements, broader capacities to avert crises and settle crisis situations within the Organisation for Security and Co-operation in Europe (OSCE) and other international organisations. Nikolay Chiker; harbinger of underwater operations? 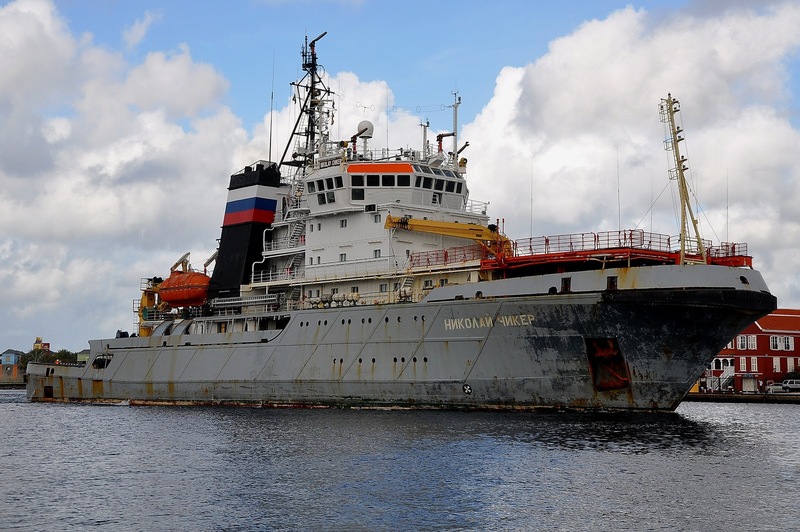 Taking a brief stop from my usual posts about visiting Cold War sites, the formerly-Soviet supertug Nikolay Chiker is still captivating my interest; mostly because it's movements are so loudly broadcast on AIS and by morse code, and it's purpose is so unclear. While it's exact mission isn't known, it isn't hiding where it's going, most of the time. Let me put it this way; if you saw a tow truck circle your block all night long, and not see anyone get towed, wouldn't you wonder what they were doing there? There's nothing illegal about circling a city block on city roads; it's just unusual, and not what you'd expect. In this case, the Pentagon has reportedly stated they knew the Nikolay Chiker was present off the coast of the US, but gave no indication why or what it was doing. There's nothing unusual about The Pentagon giving "no comment", but isn't it unusual they said anything at all? I guess there were enough queries and media coverage that they had to say something. I'm big on analogies; if you saw that same tow truck circle your block all night long, but it was a bus-sized heavy duty tow truck, wouldn't that make the scenario that much more out of place? The Nikolay Chiker did at one time hold the record for the most towing power of any tug, and it is still one of the most powerful. It was travelling in circles off the coast of Georgia and Florida, then nipping back and forth to Oranjestad, Sint Eustatius and Curaçao, part of the Dutch Caribbean. Why go so far to get a bite to eat or refuel? It seems very ususual. 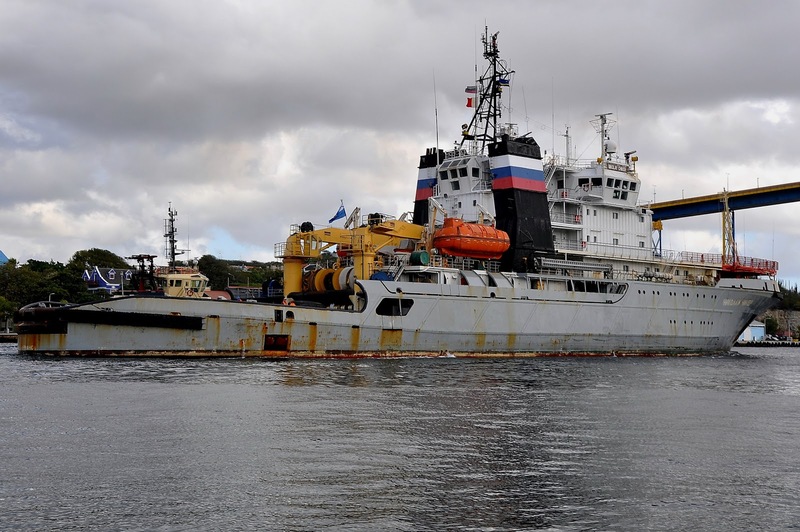 There was another Russian Naval vessel off the coast, and spooted near the Nikolay Chiker; the intelligence collection vessel Viktor Leonov. Was the Nikolay Chiker just sent along to provide aid if the Viktor Leonov ran into difficulty? Maybe, but why sail in the pattern it did, rather than tag along? Why not dock in Havana for a few weeks, rather than sail around at all? 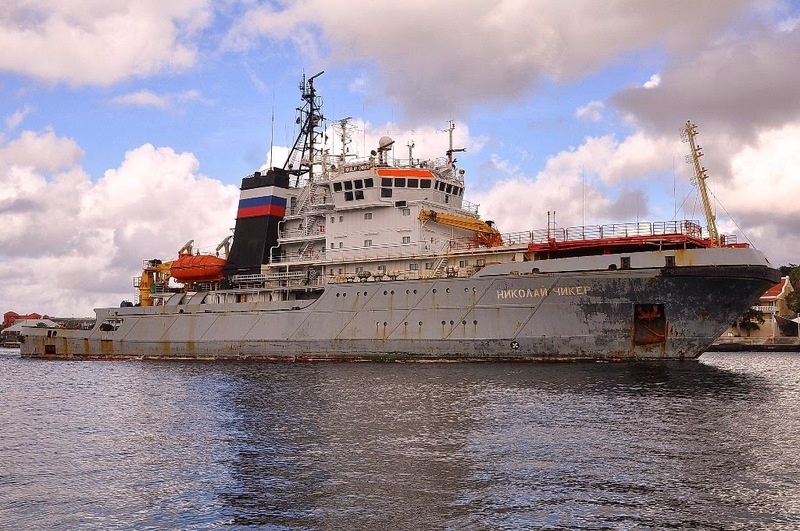 Well, like Liam Neeson, Nikolay Chiker has a very particular set of skills - I was unaware when I first started following its path that it was with two decompression chambers and equipment to allow sustained underwater operations up to 60 Meters. 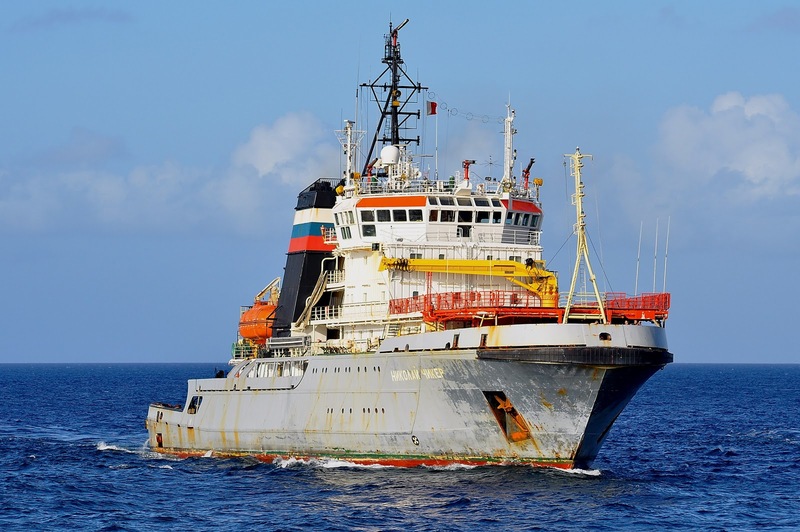 When I thought of a salvage tug, I was only thinking of the towing or lifting, but this ship is a floating underwater operations facility, not just a tow truck. I bet you're still not interested and think I'm losing my marbles; okay, I get that. What if I also told you that in the tow truck analogy, the tow truck stopped in front of your house, and did thirty (30) three point turns? Again, why? The Nikolay Chiker between April 16th ~1630Z and April 17th ~1200Z stopped off the coast of Florida and zig-zagged back and forth at very slow speed (0.5KT) for no known reason. Well, it also stopped earlier on the morning of April 16th less than 1.5Km to the West of that position and did a bunch of turns and zig zags as well. 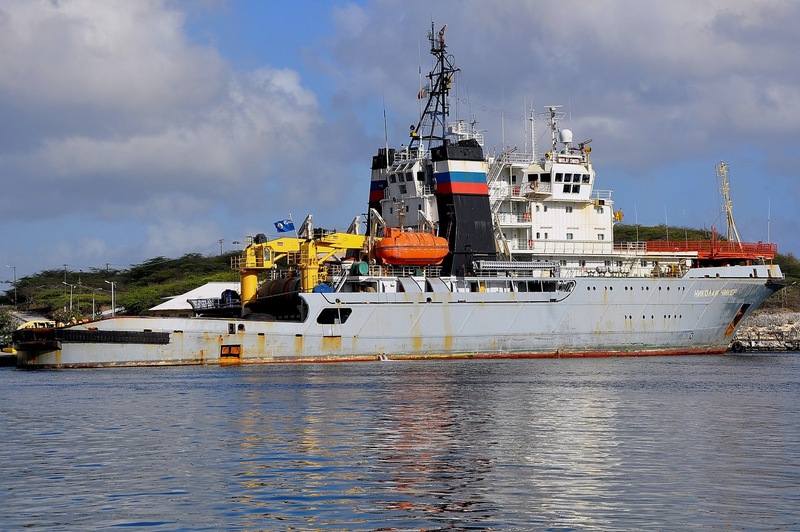 Was the Nikolay Chiker, with it's underwater sensor package, looking for something on the bottom of the ocean? Aggregating as much open source information as I could, I compiled the following specifications for the Nikolay Chiker and its twin. 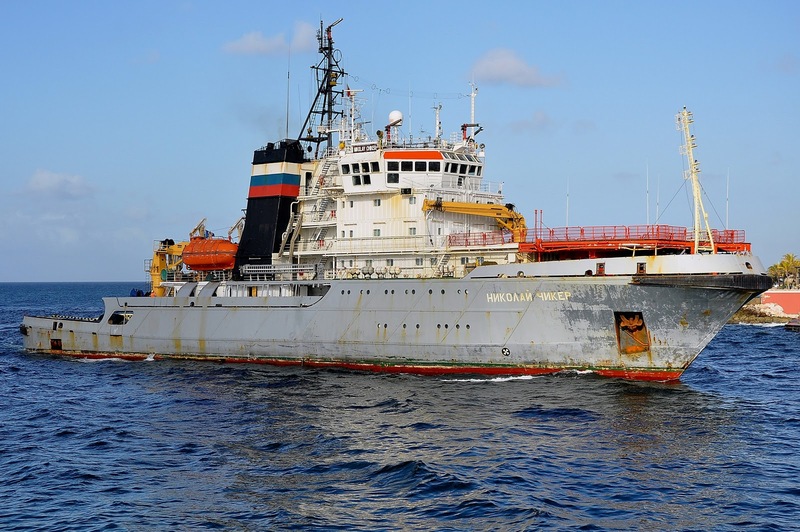 "Rescue tug "Nikoli Chiker" was built in 1989 in Finland, commissioned by the Navy of the USSR. It was intended to be used primarily for towing large ships, ie, aircraft carriers, and conduct rescue operations. The construction of these two vessels, this one and the class leader the "Foty Krilov", cost the navy $ 50 million. 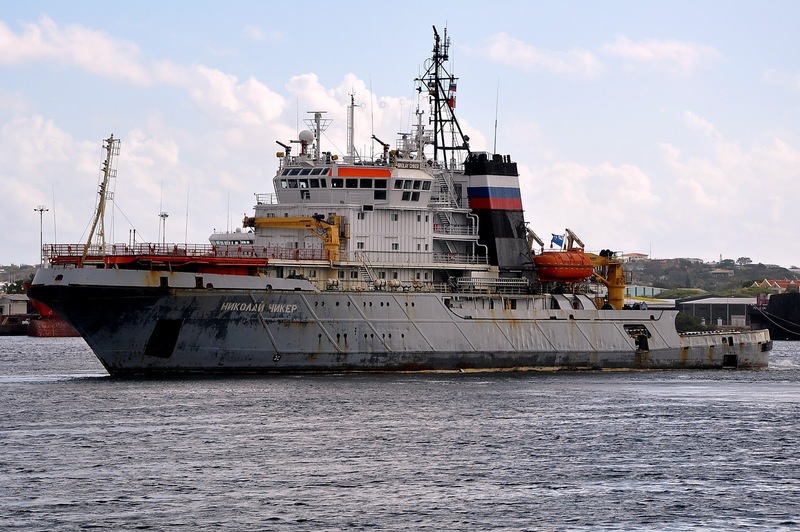 Immediately after construction during the tests, type "Fory Krylov" was recorded in the Guinness Book of Records as the vessel which can create the most powerful traction when towing. Power plant is 25, 000 horsepower. These characteristics, as well as design features allow it to tow vessels of up to 250 thousand tons at a rough sea at eight points at a speed of four knots. Performance still unrivaled. "The moored lifting power of these tugs is 230 tons. Each is equipped with diving equipment for depths of up to 60 meters (nearly 197 feet). The tugs are also equipped with two 8-ton capacity cranes. They are also equipped with water cannon. 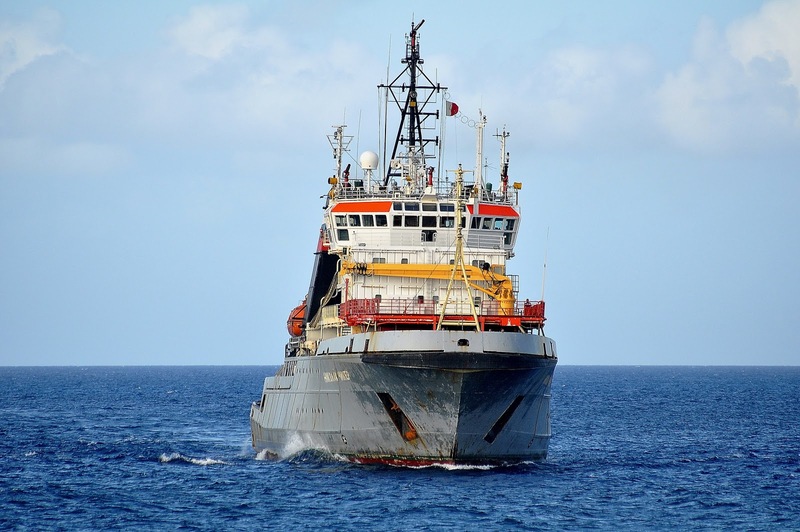 Additional equipment includes a 3-ton capacity crane; two 32-ton salvage winches; two 10-ton salvage winches; two 150-ton towing winches; one 60-ton towing winch; two 400-ton cable/chain stoppers; a 250-ton bollard pull and a 441-pound transfer system for dry cargo and personnel. HULL: These ships have a burly profile. The raked bow has a large-radius nose rimmed with a bulwark, a forecastle extending well aft, tall superstructure topped by a bridge with 360-deg visibility, paired stacks on the after corners of the superstructure and a low-freeboard stern with curved counter. The helicopter platform is forward of the bridge and can accept a medium helicopter. Frequent ShipSpotting.com contributor Cees Bustraan posted several photos that I couldn't help myself from pilfering. VHF and HF antennas are clearly visible, so is the Radar, sat dome, life rafts, cranes, winches, and much more. Photo taken from Tug Fairmouth Sherpa. 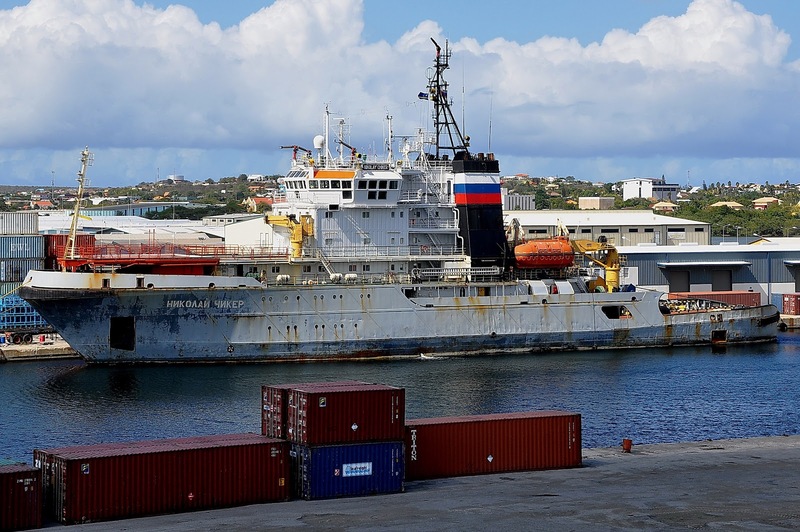 While looking for information on the Viktor Leonov SSV-175, and trying various searches to figure out where it went after it's "surprise" visit to Havana Cuba, I stumbled across the Nikolay Chiker RAL-48 (ex-Soviet SB-131 Nikolay Chiker); a Cold War-era super-tug, which was also reportedly hanging out near Florida. Isn't that odd? 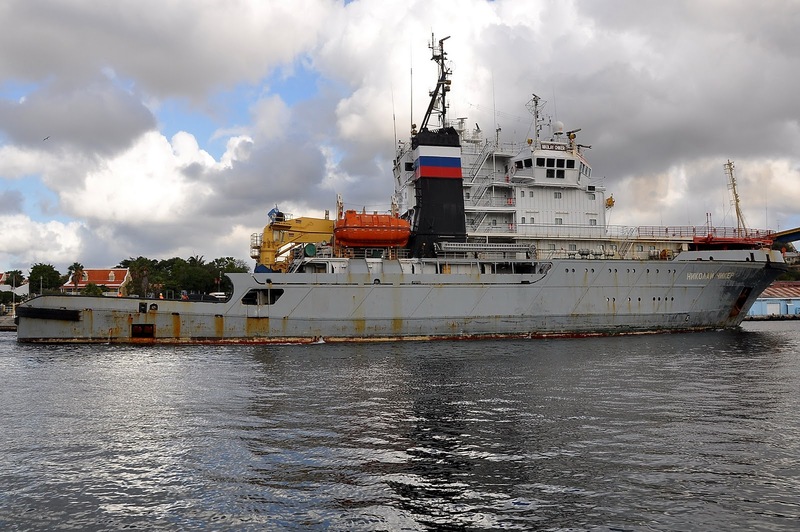 A super tug, that's now a rescue tug... a Russian Navy support ship... Why would Russia, float a support ship, from a deployment in the Medeteranian escorting an aircraft carrier task group, all the way to Florida? Spring Break? No, they missed it. Mardi Gras? They missed that too. Well, if you dig, not too deep, and pull a little Tom Clancy out of your imagination, you can guess that a support ship should be "around" other ships if it's not just going from A to B. It seems it was seen recently spotted with the Viktor Leonov SSV-175. Interesting, but... 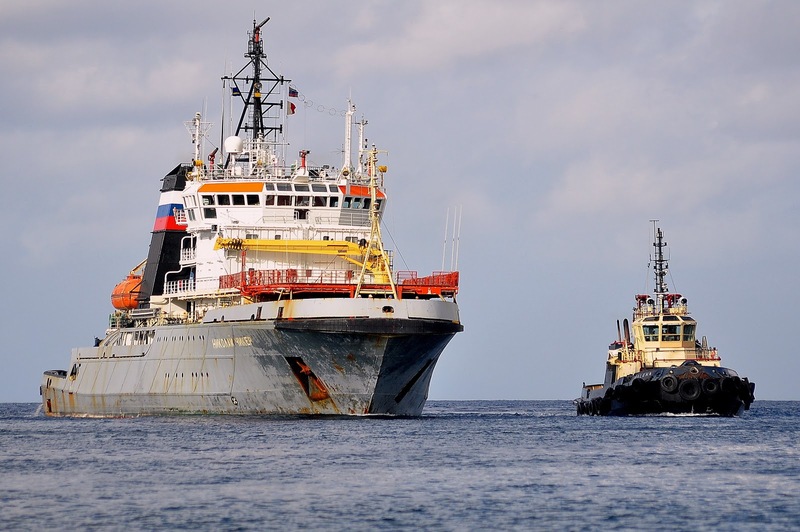 The Viktor Leonov SSV-175 is massive, fully stocked since it's trip to Cuba, and has no need for a tug. As far as I can tell the Nikolay Chiker RAL-48 isn't a resupply ship, so there's no need that I can see for them to meet up. According to quick Googling, the Nikolay Chiker RAL-48 can stay at sea up to 50 days at a time. Well where is it from? What's its home port? Murmansk, Russia... The home of the Russian Navy's Northern Fleet. Okay, more Googling... That's where 50% of the Russian Navy's submarines are located... and the Viktor Leonov SSV-175 too. Remember the ill-fated Kursk? 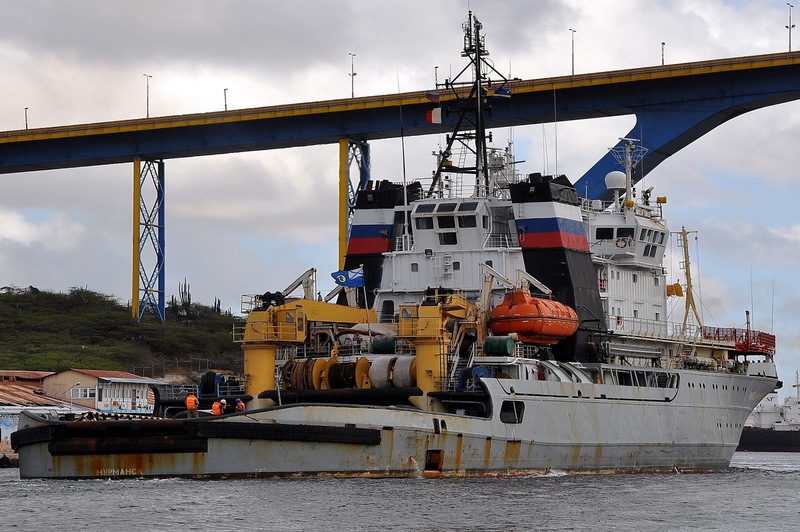 The Nikolay Chiker RAL-48 was there early in the rescue operation. Why? Because it's a rescue ship. A rescue ship from the Northern Fleet where the Kursk was from. I should mention the submarines of the Northern Fleet are an all star cast out of a Tom Clancy novel; Akula-class attack submarines, Delta-class ballistic missile submarines, Borei-class ballistic missile submarines, and some old-school Diesel-Electric Kilo-class submarines. 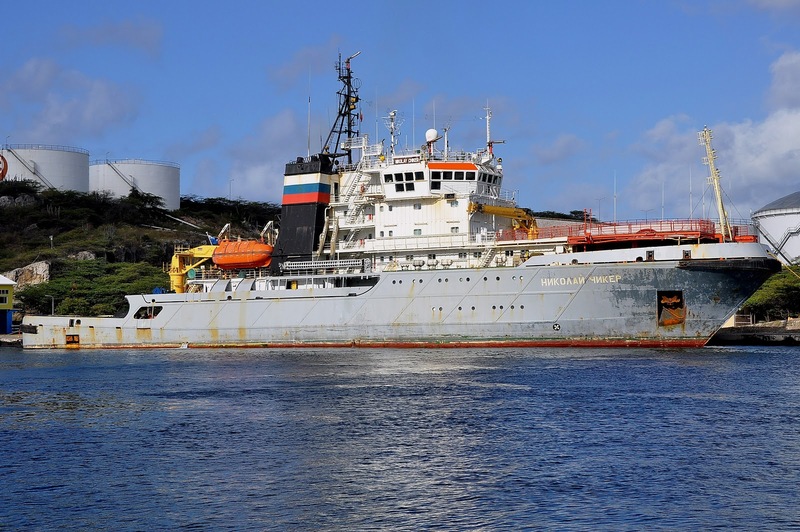 However, when things go wrong, they need a rescue tug on hand... like the Nikolay Chiker RAL-48. So... where was the Nikolay Chiker hanging out? Off the East coast of the United States... coincidentally(?) right near the United States Navy base at Kings Bay... You know Kings Bay right? That's also known as Naval Submarine Base Kings Bay - where the US 2nd Fleet operates their state of the art sub base. Oddly, it's also where this was happening while Viktor Leonov SSV-175 lurked off the coast, with it's transponder off. Remember, it's a spy ship eh. Why camp off the coast during a media event..? Right, back to the Nikolay Chiker... so we know it's from a sub-heavy Russian Navy base... it's sailing in circles apparently not doing anything off the East coast of the United States, sending morse code messages back to mother Russia every once and a while about the weather, ocean temperature and salinity... right near several American naval bases... and it is known to hang out near Russian submarine operations. Isn't it not a stretch to surmise there are Russian submarines operating off the East coast of the US, not-so-secretly, since they have a tug top-side following them around? Maybe like they did in 2012? ...or 2010? ...or 2009? A Russian attack submarine slipped into the Gulf of Mexico undetected and sailed through US strategic waters for weeks without the US Navy noticing, it was reported on Wednesday. The US military didn't even know about the presence of the Akula-class nuclear submarine earlier this year until after it had already left the gulf, still carrying a payload of long-range missiles. The revelation is part of a startling trend of Russian incursions as the former Cold War foe ramps up its military might under the leadership of President Vladimir Putin. The Washington Free Beacon, a conservative news site, quoted anonymous military sources as saying the sub was in the gulf for a month. The exact time frame of the vessel's presence was not clear. 'The Akula was built for one reason and one reason only: To kill US Navy ballistic missile submarines and their crews,' a source told the Beacon. The US Navy's Atlantic submarine fleet is based at Naval Submarine Base Kings Bay on the coast of southern Georgia. Akula-class subs are designed to run fast and quietly. They are equipped with torpedoes, mines and cruise missiles. Russia has a fleet of nine of the vessels, which are 360 feet long and are powered by a pressurized water nuclear reactor. The last time a Russian sub was spotted this close to the US was in 2009, when a pair of the subs were discovered patrolling off the east coast. 'Sending a nuclear-propelled submarine into the Gulf of Mexico-Caribbean region is another manifestation of President Putin demonstrating that Russia is still a player on the world’s political-military stage,' Norman Polmar, a naval intelligence consultant, told the Beacon. In June, a fleet of Russian strategic nuclear bombers conducted a training operation in the Arctic without notifying the American military. Then, in July, a Bear H strategic bomber, capable of carrying cruise missiles, entered American airspace near California. 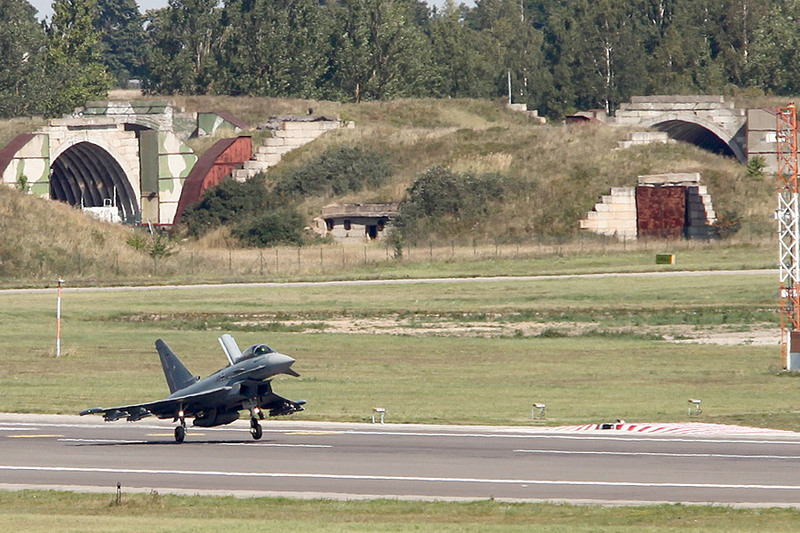 US Air Force fighter jets had to be scrambled to meet the plane and turn it back. 'It’s a confounding situation arising from a lack of leadership in our dealings with Moscow. While the president is touting our supposed "reset" in relations with Russia, Vladimir Putin is actively working against American interests, whether it’s in Syria or here in our own backyard,' Republican Sen John Cornyn told the Beacon. 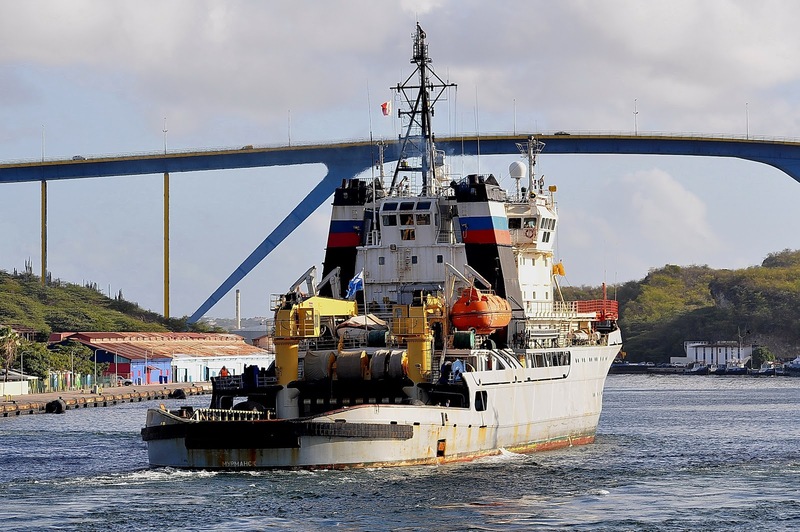 On Saturday April 19th 2014 the Nikolay Chiker arrived outside the port of Havana, Cuba and circled until Sunday April 20th when it went into the port. It stayed from Sunday April 20th till Tuesday April 22nd when it left port and headed West. So, where is it going? Searching for Nikolay Chiker or RAL-48 could be problematic due to spelling issues, so I normally just search using "chiker". Yes, there are unrelated tweets about other things... but not that many.